Pictures, video and photograph provided by José R. Verdú. A multidisciplinary scientific team made up of researchers from the Spanish universities of Alicante, Jaén and Granada, the French Université de Montpellier - Université Paul-Valéry Montpellier, the National Museum of Natural Sciences-Spanish National Research Council (CSIC) and the IUCN-Centre for Mediterranean Cooperation, and led by José Verdú, a scientist from the University of Alicante’s Institute for Biodiversity Research (CIBIO), have just published a new study which clearly shows how ivermectin leads to a decrease in dung fauna. Now there is enough scientific evidence that ivermectin-treated livestock causes the accumulation of five times more dung per hectare and year than organic livestock. Ever since ivermectin was discovered in 1981, it has been a highly effective antiparasitic drug with preventive uses in livestock. Over the years, it has grown exponentially and become a standard antiparasitic treatment, even in humans. It is classified as an essential medicine by the World Health Organization (WHO). In 2015 the research team published “Low doses of ivermectin cause sensory and locomotor disorders in dung beetles” in the journal Scientific Reports, which analysed the effects of ivermectin on the populations of Scarabaeus cicatricosus, a dung beetle playing a key role in Mediterranean ecosystems. The study showed that arthropods ingesting even low doses of this substance are no longer able to interact with their environment because of locomotor and sensory disorders, which can explain the decrease in their populations. As already proved then, ivermectin molecules are not easily degraded when excreted in livestock dung. Residues remain active for at least one month after defecation, which means they are as lethal for arthropods as they are for intestinal parasites – with the subsequent decrease in beetle or dipteran populations, among others. Thus, the negative impact on adult arthropods (beetles) is remarkable, in terms of mobility, orientation and reproductive capacity. The researcher argues that “with the previous study we did prove that adult beetles were affected, which was the key finding concerning zoological behaviour”. According to José Verdú, in this new study “we deal with the issue of ivermectin from the point of view of biodiversity and related short and long-term environmental problems. The results are unequivocal”. The newly published article proves that ivermectin-treated livestock accumulate five times more dung on the soil surface per hectare and year than organic livestock. Dung degradation is disrupted as a result of fauna and diversity loss, and therefore dung remains intact on the soil and is not degraded. This has an impact on pasture quality and soil biology, particularly on soil nutrient cycling. Scientists have also reported changes in soil biology which give rise to nitrification. Nitrophilous plants take up the nitrogen, and vegetation is altered. Thus, once proved the negative impact on areas where ivermectin has been used for twenty years, with a decrease in populations, the number of species and the dung degradation process, the research team are studying the consequences of dung accumulation in terms of greenhouse gas emission rates. Mr Verdú says: “The project we are working on now is the follow-up to this study, and we are examining the impact of dung accumulation on greenhouse gas emissions”. The amount of dung increases greenhouse gas emission rates, especially methane, and is responsible for dung beetle diversity loss. 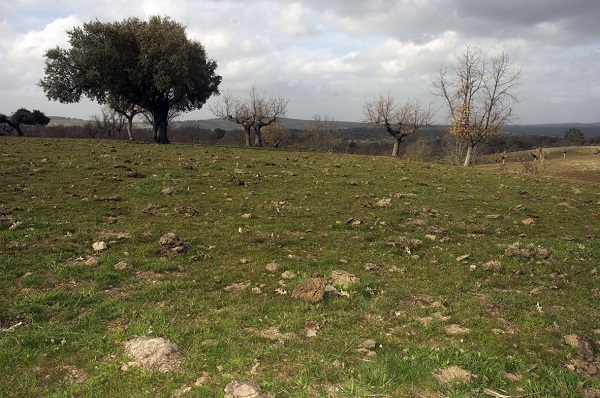 “Dung is accumulated in fields because of the impact of parasiticides on dung fauna”, Mr Verdú adds. The measurement was made in the Doñana National Park, so scientists are worried because, as pointed out by Mr Verdú, “it has been proved that this happens in a place where it should not happen: a national park. If that is the case there, it might be much worse in the rest of the country”. To undertake the study, researchers compared ivermectin-free areas with areas where it had been used for at least two decades. The Spanish Medicines and Healthcare Products Agency is aware of this and a measure could be, regarding the data specifications of drugs whose active ingredient is ivermectin, to add information on how it disrupts the physiological process in adults and the ecological process performed by dung beetles. An online version of the scientific article dated 2018 was published in Science of the Total Environment, a high-impact journal specialising in the environment. Next 15 March 2018 it will be published in the paper edition of the same journal. Pictures, photograph and video provided by José R. Verdú.